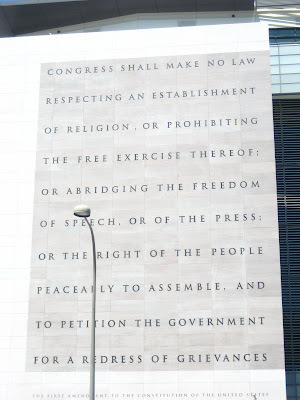 This is the front of the new Newseum, now conveniently located on Pennsylvania Avenue rather than Arlington. And it would be a pretty great picture to use with students, if it weren't for that pesky lamppost obscuring the words. There is NO way to take a picture of it that doesn't involve the light. Believe me. I tried. Also on view now are three great exhibits at the National Museum of African Art, my favorite D.C. museum. I went to be sure to see the part of the Disney/Tischman collection that is finally on display after its donation to the Smithsonian Institution in 2005. The Tischman collection is one of the world's best of western and central African art, and the portions on display in D.C. now did not disappoint. It's a beautiful set of statuary, masks, and other decorative objects, including a crucifix from the post-Christianized period in the Kongo kingdom that occurred after Portuguese Catholic missionaries left the region. Although no longer Christian in any real sense, the use of Christian icons as talismans continued for the three centuries in the Kongo; it was really fascinating to see an example of something I've read so much about. I cannot say enough about how lovely the El Anatsui: Gawu exhibit is. Most of the show deals with El Anatsui's work in metal - specifically, bottle caps that he ties together with small pieces of copper wire to create pieces that look like fabrics. One is woven to resemble Ghana's famous kente cloth. It's an incredible melding of tradition and modernity, trash and treasure, and if you're in the D.C. area, you really should go have a look. That light is what PhotoShop is for. You can remove it fairly easily. Go for it. Of course. But this implies that I 1) can afford photoshop, and 2) could figure out how to use it even if I did. Sadly, I'm not that smart. I have Adobe Elements (cheapo Photoshop) and can get that light out if you want. Email me the file and I'll take care of it for you.